Many of us can recall the thrill brought on by a certain grade-school science experiment involving nose plugs, a blindfold, raw apples and raw potatoes. If this doesn’t sound familiar (Spoiler Alert): by plugging your nose and blindfolding your eyes, your ability to detect the difference between a bite of an apple and a bite of potato weakens extravagantly. Luckily, your brain’s system of distinguishing flavor is not so flimsy as two nostrils. In fact, you are capable of experiencing flavor through two separate, but inter-woven olfactory pathways. The most recognized pathway is through our nose (Orthonasal). Historically, an active nose warned us of predators, guided us to nutritious food, and informed us of friend or foe. Furthermore, the result of sniffing evokes an intense memory-and-emotion reaction. Fascinated with the ethereal bond between a person’s warmest memories and a single whiff of Chocolate Birthday Cake or a late Autumn Bonfire, Alice & the Magician created their signature line of Aromatic Mists. The second pathway to flavor perception is through Retronasal Olfaction. As you chew food or swallow liquid, odor molecules travel from your mouth to the back of your throat. As the molecules hit the back-entrance to your nasal cavity, they reach your olfactory receptors. This back-of-the-throat sensation sends signals to your brain specifically concerning what your mouth is savoring. Some scientists assert that Retronasal Olfaction evolved only after the advent of fire, when the human diet became richer and more dynamic. As cooked cuisines diversified with spices, liquids, and fermentation, our palate needed more than one way to discern the safety of such compounded ingredients, like wine and cheese. As curious and reverent explorers of flavor complexity, Alice & the Magician created their Elixir line to stimulate and amplify the Retronasal experience. The Elixirs are an 80% Retronasal and 20% Orthonasal composition. The Mists are just the opposite. By comparison, the Mists are slightly more complex and evolve as you experience them— the initial flavor unfolds to reveal more delicate aromas. Though appealing, the intensity of the Mists in the glass slowly fades as time goes on. The Elixir flavor remains consistent strength and quality for the entire drink. Used together, it is a match made in heaven touching on all facets of aroma. Pair similar flavors like Perfect Ginger Aromatic Mist with African Ginger Flavor Elixir for maximum flavor boost. 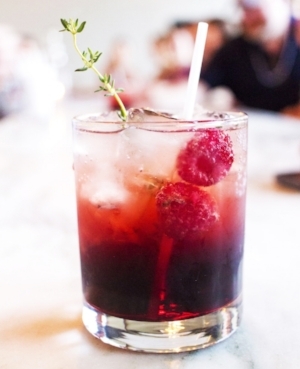 Or, mix and match for more depth and complexity as displayed in A&M's Raspberry Spritz. Herbaceous and peppery, this cocktail is a delicious call-out to the warm months of sunshine. Bright and effervescent enough to drink in the winter's low-light. Add Raspberry Liquor and simple syrup to glass. Top off with Champagne or Prosecco.